How delightful would it be to live inside a blue Tiffany & Co. box? The St. Regis in New York on 5th avenue can make this possible in their Tiffany’s designer suite designed by John Loring (Tiffany & Co. designer) himself. The suite can range for a whopping $7,500-$10,500 per night. The St. Regis in New York also houses other designer suites: Dior, Milano and Bentley with the perfect view of Central Park. The Ritz in Paris also offers the Coco Chanel suite. I inquired about the Tiffany suite when I went to NYC this year for my birthday (I did get a personal tour! ), but I came to learn it gets booked months in advanced. 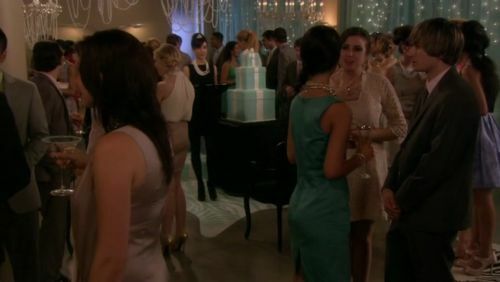 Gossip Girl’s Blair Waldorf almost had her bachelorette party at the Tiffany’s suite, but instead settled for a Tiffany’s engagement party. Share my post with a picture of any Tiffany-Blue suite decor! Oh my, your guest room is beautiful and elegant…a place where a guest will feel pampered and relaxed. I love your creative side Sonia!